The endpoints where a continental divide meets the coast are not always definite, because the exact border between adjacent bodies of water is usually not clearly defined. The Great Divide Basin of Wyoming, the continental divide splits and encircles the basin. In Africa, the most significant continental divide is the Congo-Nile Divide between the watersheds of the Nile and the Congo, passing through the area of the African Great Lakes. Between the Congo and the Sahara, a vast area drains into the endorheic Lake Chad, so puncturing the Atlantic–Mediterranean divide. The Mediterranean–Indian Ocean divide is punctured in East Africa by the endorheic lake systems of the East African Rift; in the south of the continent the divide between the Atlantic and Indian Oceans snakes between the watersheds of the Congo, Zambezi, Limpopo, and Orange Rivers, with the Okavango terminating in the Kalahari Desert. The interior of Antarctica receives very little precipitation, and that in the form of snow, and the continent is surrounded by the Southern Ocean. Therefore, Antarctica is not generally considered to have a continental divide. The Transantarctic Mountains divide the ice streams draining West Antarctica into the Ronne Ice Shelf, toward the Pacific and into the Ross Ice Shelf, from those draining East Antarctica toward the Atlantic and Indian Oceans. In Australia the Great Dividing Range largely separates those rivers flowing to the eastern seaboard and the Pacific Ocean from those flowing westward to the Murray–Darling Basin and to the Southern Ocean. However, Australia has fewer distinct ocean boundaries and fewer prominent mountain ranges, which makes it hard to clearly and precisely define any one divide. Much of the interior of the continent drains into the endorheic Lake Eyre Basin. the European Watershed with the triple divide of North Sea (Rhine), Black Sea (Danube) and Mediterranean Adriatic Sea (Po) at Lunghin Pass in the Central Eastern Alps. The Arctic Divide, in conjunction with other continental divides of North America, demarcates two watersheds of the Arctic Ocean: the Arctic Ocean watershed and the Hudson Bay watershed. This divide was a barrier to transportation until the Methye Portage was discovered in 1778, which opened up the Arctic rivers to the fur traders and became part of a transcontinental trade route from Atlantic to Pacific. It was of significance in Canadian history because it marked the northern boundary of Rupert's Land, the trading monopoly area of the Hudson's Bay Company. 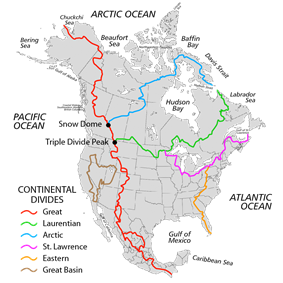 The Continental Divide of the Americas, also called the Great Divide, separates the watersheds of the Pacific Ocean from those of the Atlantic and Arctic Oceans. It runs from the Seward Peninsula in Alaska, through western Canada along the crest of the Rocky Mountains, including through Glacier National Park, Yellowstone National Park, and Rocky Mountain National Park, to New Mexico. From there, it follows the crest of Mexico's Sierra Madre Occidental and extends to the tip of South America. It is crossed by the Panama Canal and by the two outlets of Isa Lake in Yellowstone National Park. The Eastern Continental Divide separates the watershed of the Gulf of Mexico from the Atlantic Ocean. It runs from the Twin Tiers of New York and Pennsylvania along the Appalachian Mountains to the tip of Florida. The city of Atlanta sits atop this divide. The Northern Divide, or Laurentian Divide, separates the watershed of the Atlantic Ocean from that of Hudson Bay. The western part of it from Glacier National Park in the Rocky Mountains to the Great Lakes watershed marked the northern boundary of the Louisiana Purchase and was the border between the United States and British North America until it was superseded by the 49th parallel in the treaty of 1818. In Canada, it historically marked the southern boundary of the fur trading monopoly area of the Hudson's Bay Company, and the easternmost portion still marks part of the boundary between Quebec and Labrador. The divide traverses very flat terrain, especially in North Dakota, causing many travelers to believe the sign marking the divide is a joke. The St. Lawrence River Divide separates the Great Lakes Basin from the rest of the Atlantic Ocean watershed. Two canals cross the divide: The Chicago Sanitary and Ship Canal crosses the Chicago Portage and connects Lake Michigan to the Mississippi River watershed. The Erie Canal connects Lake Erie to the Hudson River watershed. Historically there were additional canals, e.g., the Ohio and Erie Canal, but most of these are no longer in operation. In South America, the Continental Divide of the Americas lies along the Andes, from Lácar Lake and south there are numerous lakes on the eastern slopes that drains to the Pacific, crossing the line of highest peaks. These lakes in Patagonia are moraine-dammed streams that used to drain to the Atlantic rather than the Pacific before the Pleistocene glaciations.